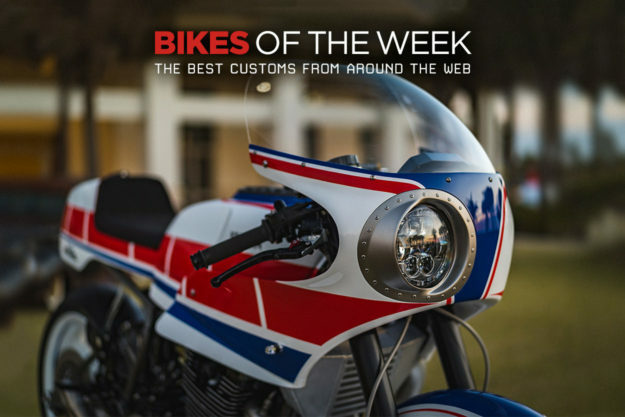 A peek at the turbo’d Yamaha that took top honors at the Forged Invitational show, a wild FZ-09 by Droog Moto, Chris Nelson’s custom Ducati Scrambler, and a modded Ducati 749 that tips the scales at just 378 pounds. Variety, as they say, is the spice of life. 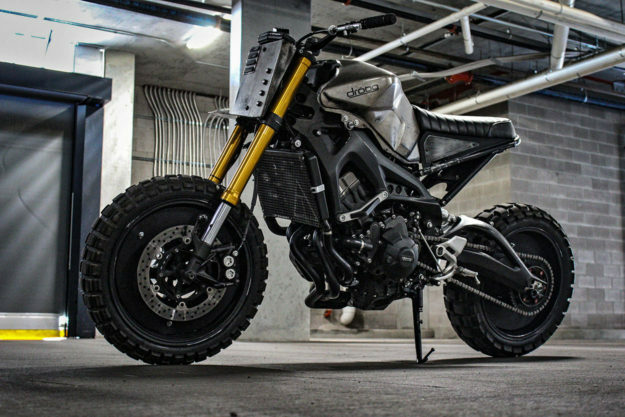 Yamaha FZ-09 by Droog Moto Concepts Arizona-based Droog Moto Concepts seem to have a penchant for post-apocalyptic builds. 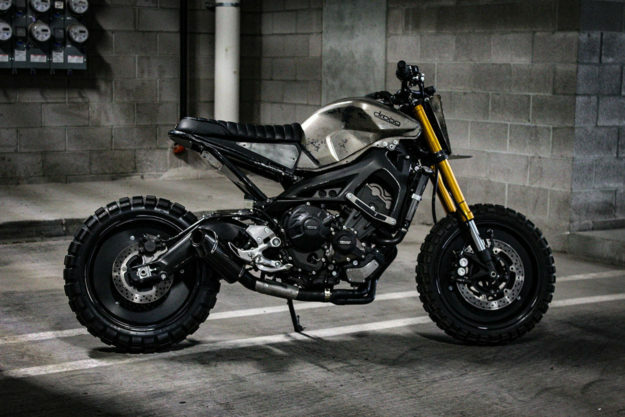 Their latest project is this FZ-09 based scrambler that looks ready to run down a fleet of flesh-eating zombies. 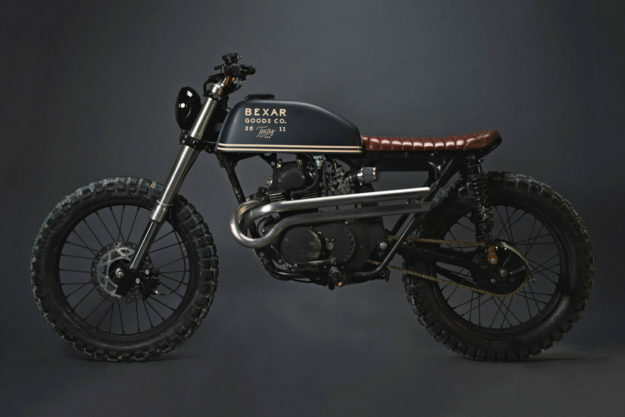 It’s riding on TKC80s and fitted with a front fender barely big enough to rest a beer bottle on—so the mudslinging potential of this triple-powered build is outshone by its brawler appearance. The rear subframe is an all-new, snubbed unit that supports an elevated perch. In fact, everything is elevated here, because the suspension has been reworked to deliver an extra two inches of travel. LED lighting keeps things legal while maintaining the stealthy approach, there’s a custom tracker-style plate up front, and the wheels are fitted with solid inserts. The tank is sporting the signature Droog finish, and the cockpit has been reworked with a new set of bars and Biltwell grips. Yamaha XJ750 Maxim by Derek Kimes The Forged Invitational is a custom bike and car show running out of Jekyll Island, Georgia featuring builds hand picked by local identity Bryan Fuller. 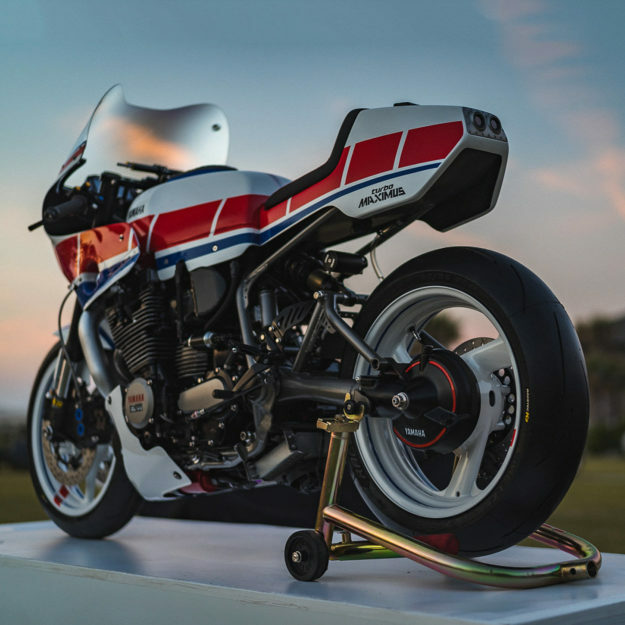 The 2018 show happened last weekend and, despite an invite list that included Analog, Revival Cycles and LC Fabrications, it was Georgia native Derek Kimes who took home the show favorite award. Derek’s called his 1982 XJ750 Maxim ‘Turbo Maximus,’ and over a year of effort went into transforming the old Yamaha cruiser. It’s now the culmination of 80s awesomeness and dear god, was it worth it. Everything has been touched, fiddled with, rebuilt or created anew (and beautifully photographed here by Steve West). An XJ900 engine was stripped down, blueprinted and fitted with forged pistons and a little water jetting before the forced induction was bolted up. Which, speaking of, has some of the most incredible plumbing work I’ve ever seen. There’s even a nifty little cutout in the Yammie’s tank that houses a blow-off valve, which must sound incredible between shifts. 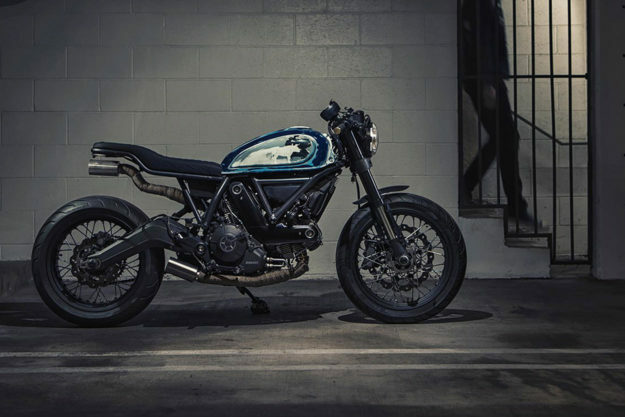 Ducati Scrambler by Chris Nelson It’s one thing to modify, customize and rework a bike you’ve ridden for years. It’s a completely other thing to take a fresh-out-the box runner and start hacking it to bits. Chris Nelson, the executive editor at Iron & Air, talks about the process of bringing his Ducati ‘Bully’ to life in the latest print edition. It’s a good read and we encourage you to check it out—but before you do, here’s the finished product. 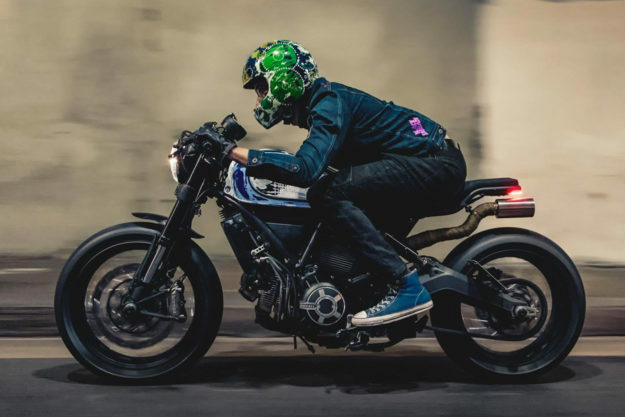 Working with LA-based Lucky Wheels Garage, Nelson knew he wanted to transform the Scrambler Icon into a unique cafe racer. To help with that effect the rear subframe was chopped in favor of a hooped unit. A tuck-rolled seat, finished in waxed canvas, was fitted in matching profile and one length of the 2-into-2 exhaust was bent to follow suit. The sound it bellows is impressive and, as I’ve experienced, Chris can be heard coming from well across town. An asymmetrical approach was applied to the aesthetics on the Sixty2 tank and many of the electronic extras have been hacked away. 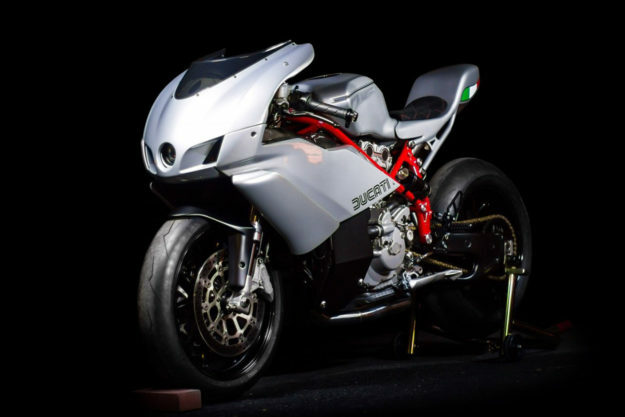 Ducati 749 by Jett Design When it first hit the market, the Ducati 749 (and its bigger 999 equipped brother) weren’t exactly the styling homeruns that the Italian marque was hoping for. But they were superior to their predecessors in terms of handling and performance. And, after some years, the unique styling has garnered some fans. 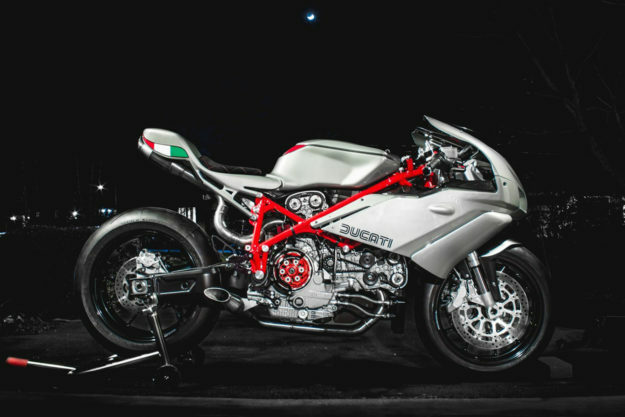 With a tip of his hat to Pierre Terblanche’s iconic work, Andrew Jett has applied his signature style to this Ducati 749. If you’re previously unfamiliar with Jett’s work—as were we—then know that this is down to the bikini fairing and chopped windscreen approach, and it’s an attitude we’re digging around here. Plus the fact that this 749 tips scales at 378 pounds (171 kilos), which is 37 pounds less than stock if you’re keeping score. Working from initial sketches, Jett tapped the lads at MotoRelic to help translate his lead into rolling art. And while they were making that happen, parts were being swapped to enhance the Ducati as a runner. 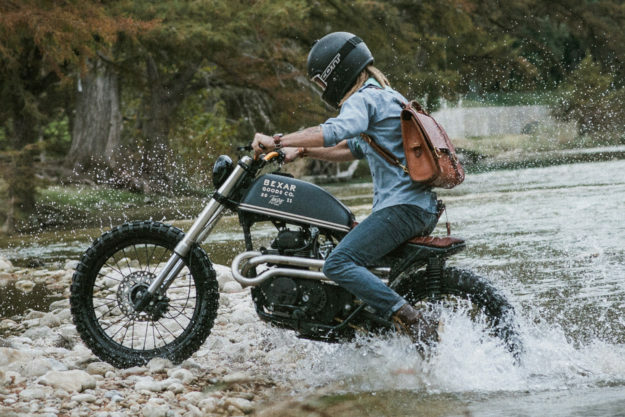 Honda CL175 Scrambler by Colt Wrangler With a handle like ‘Colt Wrangler,’ there’s a certain level of badassery that’s expected in everything you do. Or at least, I’d imagine there is. My name doesn’t pack that kinda cool. And neither does my custom Triumph, at least compared to Colt Wrangler Lyons’ Honda CL175. 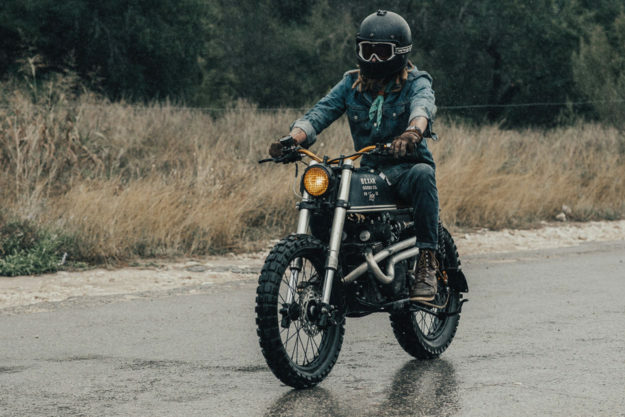 Built for Texas based collective Bexar Goods Co., Colt’s scrambled Honda was destined to travel with the craftsmen in their Airstream pop-up shop. So Colt knew he needed a scrambler bike that would be small and capable of the rough and tumble—so a little CL175 went up on his bench. The frame was hooped and detabbed and a minimalist battery tray was incorporated into a new seat pan design, which was topped by the hands of Bexar’s leather experts. A tank from a CB200 received some minor attention before it was fitted up, and then eyes turned to the engine. Nothing major was needed but a fresh coat of black and some new hardware will work wonders. The most technical part of the build happened up front. Colt wanted his scrambler to run with a set of USD forks, so the front end from a Kawasaki KX100 was co-opted. To make it all work, the steering stem from the Honda was pressed in place, after some machining, with new bearings fitted throughout.